Chris Tomlin, a Texan with the unique ability to craft a worship song larger than the state itself, has delivered songs that have swept the globe including, 'We Fall Down,' 'Forever,' and 'The Wonderful Cross.' After the success of his critically acclaimed album, NOT TO US, he returns with ARRIVING, a collection of songs embracing the theme in Isaiah 40:3-5, "In the desert prepare the way for the Lord; make straight in the wilderness a highway for our God." The all new recording captures a fresh stripped down acoustic rock style paired with soaring melodies grounded in lyrics focused on the richness and glory of our Creator. 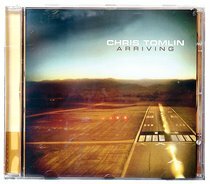 Chris Tomlin's album Arriving contains many great songs. The acoustic guitar sounds give the songs a great classical sound while Chris sings from his heart. Chris Tomlin always provides beautiful music to not only listen to, but has great depth in his words of praise. This CD features well known classics, such as How Great is our God. Chris Tomlin is renown for his stunning songs. This album brings a fantastic collection of his songs with a lovely acoustic feel. Featuring the well known songs Indescribable and How Great is Our God. This is a stunning collection of amazing songs.